Our progressive focus on comprehensive rather than fragmented care provides the ideal training ground for healthcare leaders of the future. To remain on the cutting-edge of training, we develop and expand programs that advance teamwork, communication and decision-making. 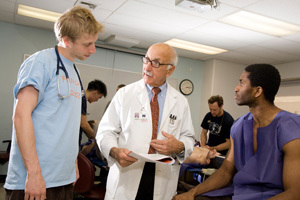 These programs, coupled with Montefiore's mission and vision draw residents from top medical schools, including Albert Einstein College of Medicine, Harvard Medical School and Yale School of Medicine, who are particularly committed to increasing access to excellent care in an underserved population. For information on our residency and fellowship programs at the Children's Hospital at Montefiore (CHAM), please go here.